If you have to reach a nut or bolt in a difficult location, nothing beats a good flex head ratchet. Unlike a traditional ratchet, the flex head allows the ratcheting mechanism to pivot “up and down,” giving you access to locations that a straight ratchet cannot get to. When looking for the best flex head ratchet for the money, consider the drive size you most often use. A 3/8-inch drive is what most will want but 1/2-inch or 1/4-inch may be needed for heavy duty or more delicate applications. For super hard to reach nuts or bolts where high torque is not necessary, you may also want to consider a finger ratchet. Built with an amazing 84 tooth design, the GearWrench 81306F is designed for operation with as little as a 4 degree turning arc. For even better access to small spaces, the ratchet head is uncommonly thin but still capable of producing the torque required for even heavy duty automotive applications. Built to exceed ANSI specifications, this 1/2-inch flexible head ratchet is at home in heavy industrial applications but also makes a fine addition to any garage tool kit. 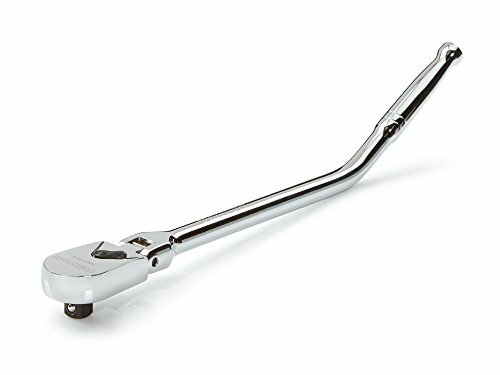 With a total length of 17 inches, this ratchet will give you all the torque you need, and the flexible head can pivot as much as 90 degrees to get into tough spots. 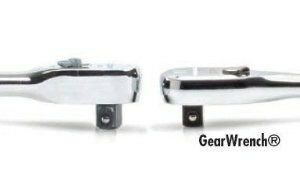 A problem reported by a small number of users of the GearWrench ratchet is that the ratcheting teeth may have a tendency to strip over time, especially when the flex head is used in high torque applications. Other than that, you will find that this tool lives up to the GearWrench reputation of professional quality tools at affordable prices. It’s heavy enough to stand up to hard work and versatile enough to use in almost type of work condition. If you’re looking for quality and performance in a heavy-duty flex head ratchet, this is the one to add to your tool chest. With a 3/8-inch drive, the Tekton 14967 is a great flexible head ratchet choice for light and medium duty applications. The head is capable of swiveling up to 180 degrees and can be used at 7 different angle settings. Additionally, the 11-inch long bent handle has a 25 degree offset, so you can reach around obstacles that other ratchets cannot come close to. The 72-tooth design means that the ratchet will operate with only a 5 degree turning arc, so you can use it in spaces that have very little room to work in. It will go places where a fixed ratchet from a typical socket set won’t. As far as problems go, about the only thing you may encounter is a tendency for the vanadium chrome finish to wear through over time, but that is a process which will take years to happen, and the ratchet will still operate fine even after the metal begins to show through. This ratchet is a little shorter than the GearWrench model, and that means you will not get quite as much leverage for torque, but it is otherwise as good or better (depending on your needs), and the offset handle more than makes up for the shorter tool size.